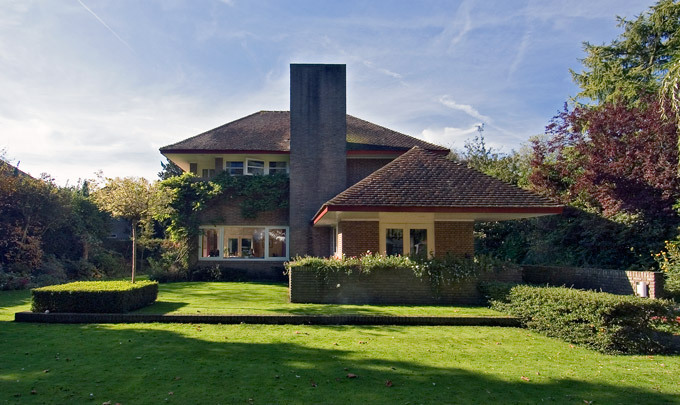 Hendrik Wouda is best known as a furniture designer and an architect, particularly of freestanding houses that exhibit the powerful influence of Frank Lloyd Wright's prairie houses. In this one the gently raked jutting roofs, freestanding upstand walls and even the broader horizontal joints in the brickwork lend it a strongly horizontal character. It is, essentially, a cube-shaped dwelling with an annexe on two sides, a storeroom at the rear and a parlour at the front whose roof projects 2.9 m.